Love for Everly: What's Next? Today marks seven weeks since Everly went to Heaven. ﻿﻿No, today isn't any easier than it was before but we've learned to cope better. 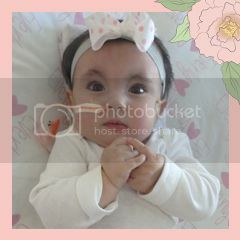 Everly at 4 months old. Right away we knew that keeping busy would be beneficial for us. Necessary even. And busy we've been! So much so that I'm having to carve out this time to write much like I did when I would hold Everly in my lap and write in previous posts. ﻿﻿So, here I sit trying to encapsulate our life for the past few weeks since Everly's Celebration of Life February 20 and the only comparison I have is that it's like a roller coaster. It really has been. We've had a touring-like schedule during the day, with Jimmy working long hours and me with the boys, school and catching up, but each night ends the same for Jimmy and myself: tears of sorrow and hearts hurting an unspeakable, unimaginable pain that is our now constant companion. It's there. All. The. Time. Know this when we are out. When we are working in the yard. When you run into us at Publix. When you see us at the gym. When we are at church. Yes, even when we are laughing. But when the sun goes down and the children are all nestled in their beds, visions of sugarplums, unfortunately, are not what's dancing in our heads. Simply put: we miss our daughter. We miss holding her. We yearn to hear her, smell her, to kiss her, to see her smile. It is still to us, 7 weeks later, unfathomable that we will not have that again while on this earth. It is every parent's worst nightmare. To lose a child. But here we are living it. Having to go on and move forward. Having to figure out how to live when you have a hole that can not under any circumstance be filled. That is what we've been trying to figure out for the past 50 days, 7 weekends, 1176 hours and 70,560 minutes. But, just like a modern day fairy tale, this story does have a happy ending. ﻿﻿We have to make it so. We are responsible from here on out with how we choose to live. We have free will for how we handle our sadness. We make decisions daily to live with intention in our grief or to let it get the best of us. Everly would want us to be happy. To make others happy. To encourage active living. We desire to take our love for Everly and to love others. We long to share how she lived life to the fullest and help others do the same. Diagnosis, limitations, predicaments do not have to be barriers. We hope to share these messages. So with that Everly's Angels was born. Everly's Angels is still in its infancy with planning, goals and how it will impact others. However, our heart is and will remain to share love with all and to help others live life well. Everly spent much time in the PICU as well as some time in the NICU at birth. I was fortunate that I could spend every night there while Jimmy or my parents were with the boys. However, not all babies and children were able to have a caregiver remain in the hospital with them. Some parents both work full-time, some have other children to care for at home and still others just live too far away to make it a feasible option to commute daily. As unbelievable as it was for me to accept, there are other situations where one or both parents were not allowed to visit the child in PICU. After spending time contemplating the experience we had in the PICU even though it was a "hospital" stay, we realized that two things made it so...the nursing staff (y'all already know how we feel about our friends there) and how we chose to spend our time. 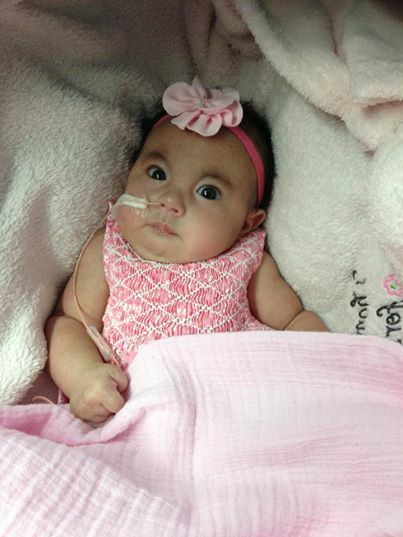 We chose to make the most of each day we had with Everly, including those hospital ones. Our heart has been touched that one of the ways we would like to help is with our time. God wants us to give of our time, talents and treasures. 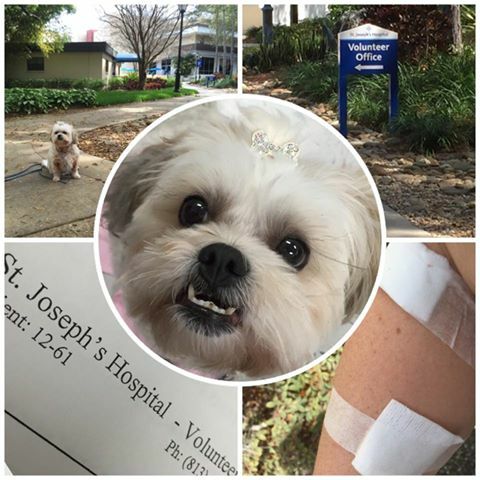 I began the process last week of becoming a Pet Therapy volunteer with Ala, our 5 year old malti-tzu, at St. Joseph's Children's Hospital. Some of you may know that Ala has been making therapy visits to nursing homes and in elementary schools for the past 5 years now. So, we are thrilled that we will be able to bless those children in the PICU with what might be there only non-medical visit of the day. The babies in the NICU sometimes aren't able to have a caregiver stay with them 24/7 for the same reasons as those in the PICU. We would like to fill in some of the gaps. So, my parents, myself and Jimmy have a heart to become "cuddlers" there...feeding, changing diapers and providing another set of arms to soothe a crying or fussy baby. Right now, they have no openings for this volunteer position but the application is in :-) Prayers that a spot opens up when God deems it the right time. Our almost 16 year old son also was touched by his sister and has a heart for special needs children. 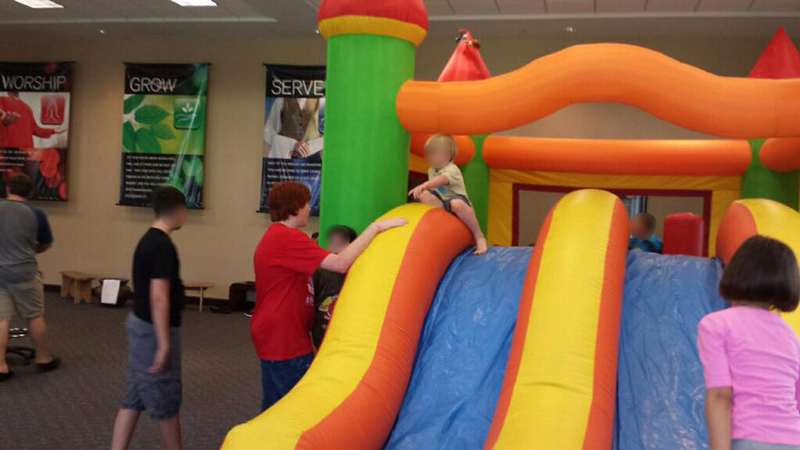 He volunteered this past weekend at a local church's respite care day for parents. He enjoyed it so much that he has decided to continue to go back. Jimmy and I also were asked to participate in a NICU Parent Support Group to assist other parents. Some of these parents, like us, will be entering this new world of machines, tubes and special needs like we did. Some just need to know that living outside the NICU is possible. And others just need someone to talk with who understands. We are so excited about this new project! These are just three examples of ways we are beginning our new "next." 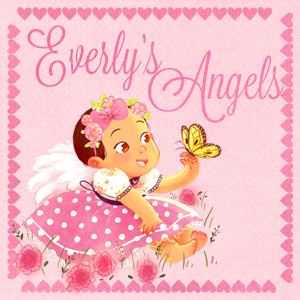 Our heads are buzzing with ideas for the future of Everly's Angels and our hearts soaring! We now have an open Etsy store with Team Everly t-shirts, sweet peas and even specially designed bookmarks. All proceeds will go into future plans for Everly's Angels. We do not know where this new path will lead us, nor who will be touched by it but we do know that the way Everly touched us is how we would like to impact others. If you have a heart to get involved or just would like to help us brainstorm with us, we would love to hear from you! I know many of you are much more experienced than we are and we need YOU. Thank you, family, friends and complete strangers, for walking alongside us on this walk. Thank you for taking the time to get this far down in the page, too. We appreciate every single thought, prayer, call, message or kind gesture toward our family and on behalf of our family. With God's love and with your support, we CAN continue and not only continue but to share Everly and her message with ALL! Everly's Angels - so beautiful, just like their namesake. I'm excited to see the work of Everly's Angels! Giving of yourselves to little sweeties and their families, whose circumstances y'all know too well, will be such a blessing. I think I shared with you one of the things Everly taught me is that "Every Day is a Special Occasion!" and now Everly's Angels will be bringing that to so many in ways yet to be known, but I love it already. Every cuddle, every Ala visit, every smile, will mark a little sweetie's day as special - so perfect. Thanks, Aunt Bees!! Much love to you and yours! I love that scripture, too, and it is spot on! We will rejoice in today! We just placed an order..what a wonderful idea. You will touch so many babies lives. Sweetest family. We think about sweet pea all the time. God Bless you always. Thanks, Sonia! We appreciate the love and support! Can't wait to see what the future holds! Thank you for your writings. You say things that are in my head that I can't get out. Today marks 6 months since my baby girl left our side. We work each day to honor her life and legacy. We have a long road ahead but love keeps us moving. Thank you for sharing your Everly, your journey and your words.